First came the royal blue t shirt from the classic superman cape colour and now comes the same royal blue skinny jeans style. This popular colour is great for the summer or a good party night out and would fit any kind of colour combination for the tops. The royal blue colour is not quite a neon but is really a nice bright vivid colour and would make any one stand out from the crowd. The skinny jeans which we offer is not just cheap in price but is really a great quality stretch fabric twill jeans with low-rise waist with a slim, skinny leg. It is a classic five pocket style pant, and a zipper fly with a button. 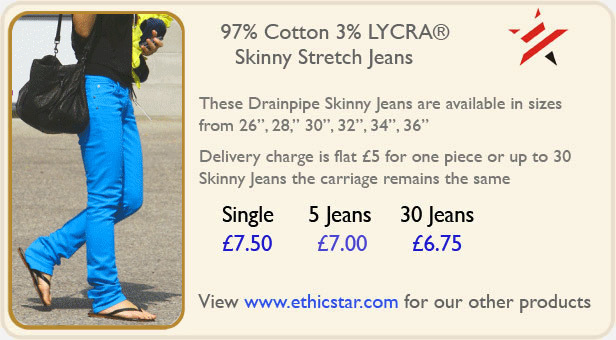 Check our the complete range of skinny jeans. © 2015 Black Hoodies UK. All Rights Reserved.